The colors this Autumn have been spectacular!!! I was out driving yesterday and was so enthralled with the colors around me I had to keep reminding myself to keep my eyes on the road!! I hope to get even more pictures for you although I have so many now that they would probably last all Winter if I showed them to you. OH! I just LOVE what I do and am SO in LOVE with Mother!! Bright full leaves for a good morning waking up. Good morning, Amy. Please have a good day. You did a great job Amy. I know the feeling of seeing the glow in the forest, and I know how hard it is to capture. This is very nice. The back lighting was perfect for this shot, Dan. As I stood there rooted to the spot (again) the awe grew to such a height, I had to sit down just to absorb it all. It was as though I was under a canopy of orange and Mother was just reaching out to me giving me such brightness to lift both my weariness and heaviness of Heart. Thank you Amy. Wish you a great day too. It is beautiful Amy! I would love to see what the picture looked like before you edited it to get a perspective on what all you did. (Not that I know that much about it!) LOL! Just think it would be fun to see the difference! Keep on enjoy the beauty Mother Nature has to show us! that is so amazing. I have had those moments and they are life-altering! you are blessed to have experience it. I am so happy for you. Looks almost like a forest fire! Reblogged this on Reiki Dawn. You’re welcome. I am. Just baked a cake and am awaiting our son in law for his birthday. Have a great weekend! I’m glad you had fun with them and it is so well worth it. I’m noticing that with a lot of these fall photos, you seem to be actually darkening the shots and it’s just enhancing the colors. This one is just terrific. Always Amy! You can’t go wrong. Great autumn colours – we are now into late spring with lots of pinks and purples. I’ve noticed, if I turn off my bathroom light, my teeth glow… Yes winter is almost upon us, and I still have these damn boots that make my toes stink! Maybe this year, I’ll just rent a camel. Do you have any camel rental agencies where you are? That phone of yours is quite the gizmo! Are you thinking of going out for Halloween to capture all the gouls and such? I think I’ll dress up as a Nurse, and try to find a new home. LOL! Oh, darling woman, I ADORE this one. You’re on fire Amy. 🙂 Gorgeous glow! Don’t worry about completing the circle of communication in writing. Just say a little prayer of love my way, and we are connected. Happy friendship day!!!!! Amy, the colors at your place is awesome! It is the most beautiful time of the year for me. I hope it is going to last a little bit longer. Enjoy the Fall! 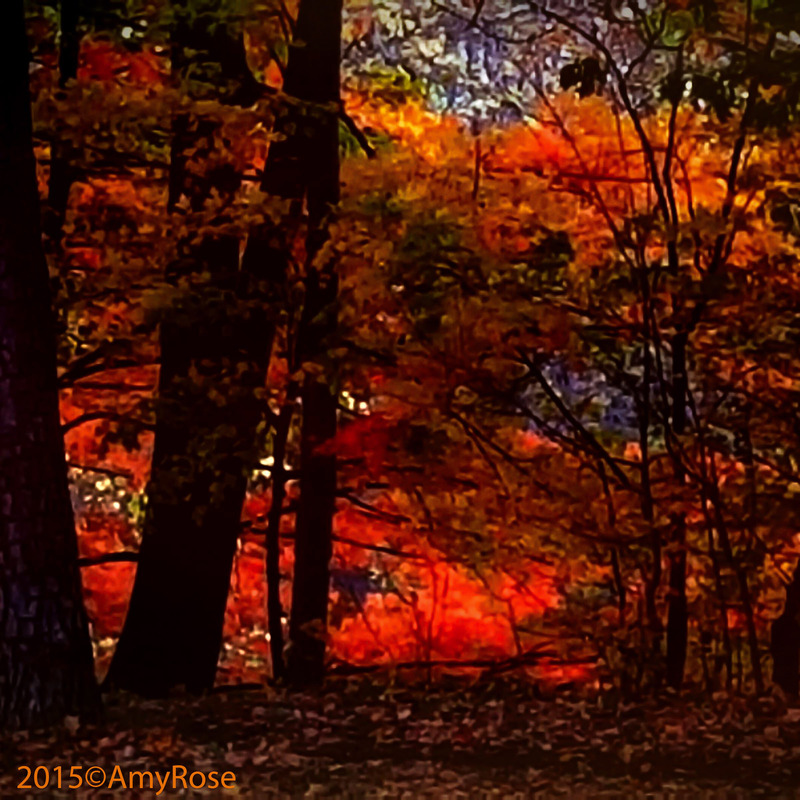 Amy, Fall is my favorite season! No matter what weather it is I love it. I am right now in the big home project. And all of that make my life full and happy. Some gardening is in my plans as well. That is a really gorgeous fiery photo! Beautiful. Thank you.